Dr. Varu was gave me a very good explication about my operation and all options available. I was very pleased witheveryone at the office. Had to reschedule my appointment last minute but the office staff was very accommodating! I look forward to my next appointment! 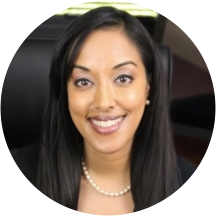 Dr. Divya M. Varu is a board-certified Ophthalmologist specializing in the care of cataract and refractive surgery patients at Dell Laser Consultants. As a fellowship-trained surgeon in iLASIK and Advanced Surface Ablation, she provides a customized treatment plan for patients in order to meet their individual needs. She is also a skilled cataract and refractive lens exchange surgeon, performing surgery using full focus intraocular lens implants. With her expertise in a wide range of complex pathology, Dr. Varu has expanded the services provided at Dell Laser Consultants to include comprehensive eye care. She cares for patients with dry eye disease, ocular allergies, keratoconus, glaucoma, and retinal pathology. Dr. Varu strives to translate the spectacular advances of medical science and technology into quality care for her patients.